The trouble with 3 very needy children is that there is never enough of me or enough time to give them all what they need. In fact it feels like the more I give the more they demand, it never seems to be enough. I went on a lottery funded workshop recently about ‘Supporting Siblings’, the focus of the day was how best to meet the needs of siblings of a child with special needs. This is a little bit more tricky for me due to all 3 of my children having special needs. 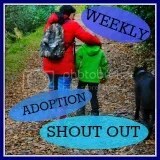 However I did take away something useful which I was able to adapt to suit our family. A suggestion was made that we try out a ‘special time’ jar. A jar or box that contains a selection of short activities that take no more than 10 minutes, things like read a book, watch them dance or sing a song, paint their nails, watch TV together etc things like that. This would enable the sibling to let their parent know that they were feeling left out or feeling lonely and needed some attention. I really liked this idea but the more and more I thought about it, the more I realised that It just wouldn’t work here. The minute 1 daughter bought me her box of activities the other 2 would decide they also needed my time turning 10 minutes in to 30 minutes, and you might not think that 30 minutes sounds like much but that would be 10 minutes of me trying desperately to give a child 1:1 whilst her 2 siblings do all they can to get my attention on to them. It would also mean that it would be in constant use, a race to get to the jar, a competition to see who can use the jar the most, an argument over who’s had the most turns. A headache for mommy! So I started thinking about how I could adapt this to suit us. Giving the girls 1:1 time is pretty much impossible, even when Daddy is home we’re still out numbered. So I decided it needed to be more manageable, less likely to create competitiveness and more likely to keep us all happy! So that left me with a Jar of Hugs! I like the idea of a jar with an endless supply of mommy hugs, big girl and middle girl are less into hugs (unlike baby girl who would hug me all day), so it has the potential to encourage them both to become more tactile in a fun way. It also means that even if they all decide they want the jar at the same time, we can still have a ‘group hug’! It gives me the freedom of being able to say ‘mommy needs a hug’ so I can also show them that mommy’s need hugs too, in which case Daddy can step in if none of them oblige! And more importantly, it gives them the opportunity to get my attention in an appropriate way! 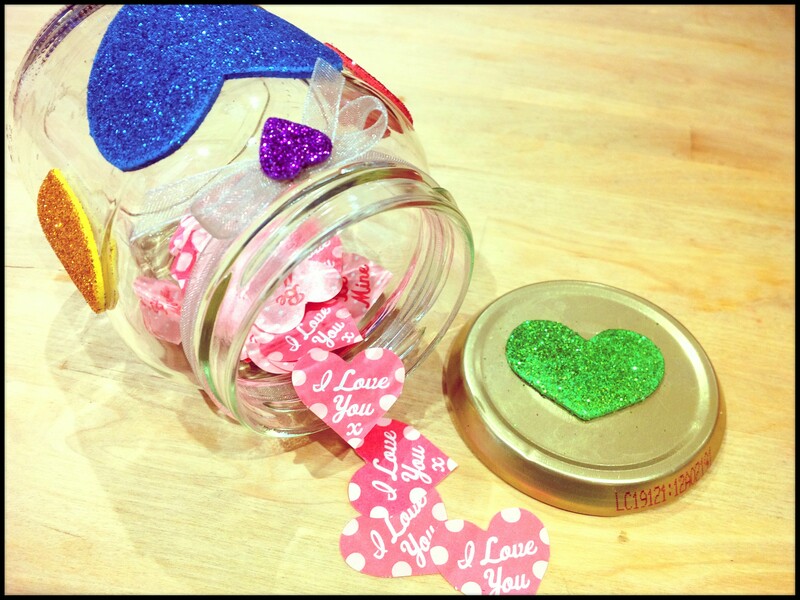 So here it is, my mornings creation, an empty jar filled with left over valentines confetti and decorated with stickers from their craft box! I never claimed to be creative! 🙂 Wish me luck! I was thinking today about when I was a child. I remember playing ‘fish and chip shop’ with my brother. We cut up paper and pretended they were chips and then used more paper to wrap them up and ‘sell’ them to one another. I remember pretending my swing was a cooker and mixing ‘mud pie’ or ‘magic potions’ in a plant pot sat on the swing seat, we did lots of imaginative play when I think about it, but I also have memories of just sitting. I remember watching my mum sing and also times when I would sing along with her. I remember watching her make me lunch whilst I chatted away besides her, just happy being there and chatting. I had no toy in my hand, there was no tv on, it was just me and my mum ‘being’ together. I remember sitting on my Nannys lap, just because I wanted to talk to her, she didn’t have anything for me to ‘do’, and it wasn’t so I could get a better view of the tv, it was so I could sit with her, or talk to her. I talked a lot as a child I’m told! There’s been no change as an adult, I’m still a chatter box 🙂 I also remember lying on the sofa on my back trying to count the flowers on the wallpaper on the ceiling, just because I could. I remember sitting and pulling faces at myself in the mirror for ages! I used to like watching myself cry in that same mirror I’m told, that was clearly the start of the drama queen bit in me! But what I’m getting at is that I was happy to just do nothing sometimes, even if it was only for a few minutes, I was only a child after all, my attention span was just as short as the next child’s, but I was still happy to just ‘be’. My girls never do this. In fact, I tried to think today of a time they were just happy to ‘be’. I couldn’t. They constantly need ‘something’ to do. Whether its tv or toys. They NEVER just sit and talk, and unless they’re asleep they never stop. They’re never content to just ‘be’. I’ve struggled to explain this, and I don’t think I’ve done it very well here either, probably because I don’t really understand the ‘why’ behind it all. I’d be interested to know your experiences and thoughts. Do you have memories of being content to just ‘be’ when you were a child, or how about your child, were they or are they happy to just ‘be’, even if only for a minute or 2? Tonight I was greeted at school by a pale, red eyed exhausted looking baby girl, and an unhappy looking teacher. Before the teacher got chance my baby girl told me she’d been spitting on the playground at dinner time. She didn’t hesitate, she owned up straight away, she looked worried but this was short lived as she skipped across the playground shortly afterwards. So tissue bombs Monday, spitting Thursday, what’s going on, somethings wrong!